Business finance teams, freelance accountants, CPAs, and small accounting firms can have a handy tool at their fingertips when they decide to use ATX. Designed by Wolters Kluwer’s CCH Small Firm Services, it’s a premier software used for tax return preparation. It’s a desktop solution that comes with a tax compliance form library. Whether the user is an accountant, business, or entrepreneur, they can be confident that they are meeting all necessary regulations as all the required forms can be easily accessed. ATX can also easily be transformed into a comprehensive software suite as practice management and tax law research systems can be easily integrated with it. 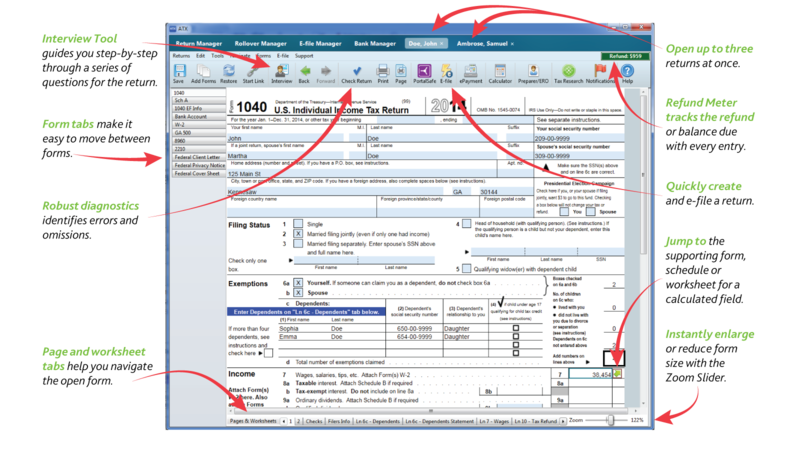 All of this together lets users have a seamless workflow, whatever aspect of tax management they are dealing with. Tax compliance is easy with ATX’s vast library, which features more than 7,000 forms. Accountants can also easily meet the specific tax needs of their clients or employers with this library. Users who may not be as technologically-savvy don’t need to worry about a steep learning curve when using ATX. Its interface is user-friendly and allows users to work on up to three forms with ease and navigate comfortably through fields. Mistakes when filling out compliance forms are avoided with the interview tool that comes with ATX. Forms can be filled out without making mistakes, and time is also saved as the software does the reviewing for the user, checking for omissions and errors. Users can be sure that their forms are compliant and meticulously filled out. ATX users can expect an increase in productivity since the software has tabs that let them quickly switch between different forms. Users can also work on up to three different forms at a time. Not only is their productivity increased, but they can also make sure their work is done on time. Any difficulties encountered with ATX can be easily resolved, thanks to a knowledge library that users can easily find online. Productivity tools, newsletters, and practice aids are also sent out to users so they can continuously learn how to use the product to their advantage. Practice management and tax law research systems can integrate with ATX.